It was a time of rapid change for baseball. “We went from day to night games and from radio to TV,” says Erskine. “We went from trains to planes and from segregated to integrated. Then we went from East Coast to West Coast.” And it was a different L.A. While Latinos now compose nearly half of the team’s fan base, in April 1958 the Los Angeles Herald-Express saw fit to run a front page image of the Coliseum with a superimposed cartoon of a smiling, side-burned batter wearing a serape, huaraches, and a sombrero emblazoned with LOS DODGERS. Fernandomania was two decades away, and by 1959 the team’s new stadium was being carved into Chavez Ravine on the site of a Mexican American village. Though first cleared for a massive Richard Neutra-designed housing project that was never built, the community’s demise often gets blamed on the colossus that rose in its place. Because of the odd configuration of the Coliseum, Dodger fans quickly grew accustomed to bringing their radios to hear Scully’s play-by-play, and the team became an early example of the blending of entertainment and sport. “As far as my career was concerned, the biggest break we got was the transistor radio. It helped us to actually talk directly to the people in the ballpark,” says Scully. With stars like Sandy Koufax, Don Drysdale, and Maury Wills, the Dodgers became the city’s original Showtime. Frank Sinatra sang the national anthem for pal Tommy Lasorda’s first game as manager in 1977. Lasorda still makes it out to games, embodying a tradition that has evolved from the days of Walter O’Malley through the wilderness years under the Fox Entertainment Group and Frank and Jamie McCourt to today, when on a summer night, Dodger Stadium feels like the one place in this diffuse, diverse city that belongs to all of us. 1958: On April 18, Dodgers play Giants in their first L.A. game. 1959: Five months after 93,103 fans show up for a game honoring catcher Roy Campanella, who was paralyzed in an auto accident, Fairfax High alum Larry Sherry leads Dodgers to World Series championship against White Sox. 1962: Dodger Stadium opens; team sets major league attendance mark (2.75 million). 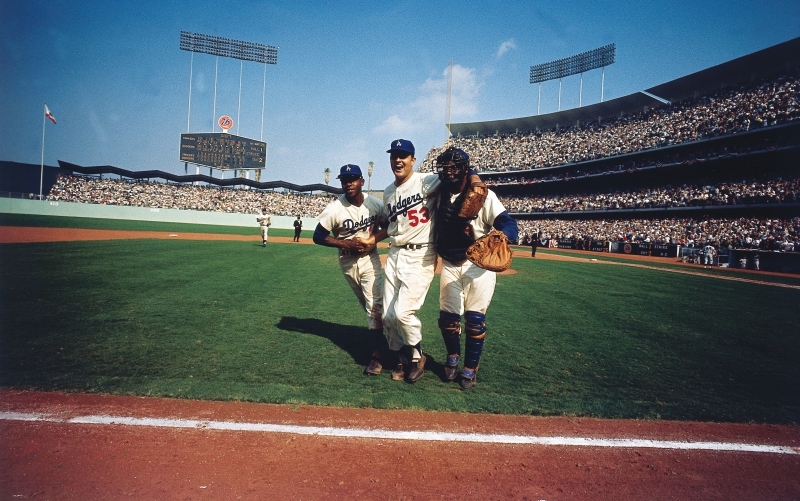 1965: Dodgers defeat Twins in World Series when Sandy Koufax, who’d refused to pitch on Yom Kippur, wins two games. 1973: SteveGarvey, Davey Lopes, Bill Russell, and Ron Cey start the first of 833 games together, the most ever by an infield. 1977: Manager Walter Alston retires. Former Dodger pitcher Tommy Lasorda steps in, winning two World Series and four pennants. He retires in ’96. 1981: Fernando Valenzuela opens season with eight complete games (including five shutouts). Fernandomania begins. Team beats Yankees in World Series. 1988: Clayton Kershaw is born; Orel Hershiser breaks Don Drysdale’s consecutive scoreless inning streak three weeks before Kirk Gibson’s homer propels team to World Series title. 1998: Ending 48 years of ownership, the O’Malley family sells Dodgers to Fox Entertainment Group. Future Hall of Fame catcher Mike Piazza is traded two months later. 2004: Fox sells team to Frank and Jamie McCourt, who hire a Russian physicist/ healer to improve team energy. After an epic divorce, Frank places club into bankruptcy protection. 2012: Guggenheim Partners buys team for $2.15 billion, funds league’s highest payroll and major stadium renovations. 2016: Five years after Don Mattingly debuts as manager, Dave Roberts takes over. Vin Scully calls his final game after 67 years. 2017: Team goes to first World Series since 1988, losing in seven to Astros. RELATED: The High Five’s Secret Ties to L.A.